When real estate operator F. de R. Wissmann sold the 1872 brownstone at No. 11 East 84th Street for Myer Foster on March 11, 1901, The New York Times remarked “The purchaser will probably erect a new dwelling on the lot.” The house had been home to Myer Foster and his wife, Eva, for years. What the journalist probably did not know was that the purchaser was Foster’s own real estate broker. Those of the “class of people” who sought out residences “suitable for entertaining” were, frankly, rich. And the architects did not disappoint. Warren & Wetmore created a stunning pair of limestone clad, Beaux Arts palaces completed in 1903. No. 11 was a bit more boastful with its bowed, two story bay which sat on a lavish pair of brackets and a centered cartouche. The elements were entwined with dripping garlands of fruits and flowers, and swirling ribbons. A stone balcony with handsome iron railings flowed along the fourth story of both houses, bulging out as it followed the lines of the bay at No. 11. The mansard roofs of each were distinguished with three French, copper-clad dormers. F. de R. Wissmann boasted in his sales advertisement "The chief distinguishing feature of an English Basement House consists in the Kitchen being placed on one floor alone with the laundry and servants' hall, and not on the entrance floor, which is so objectionable in the American Basement House." He pointed out that on the entrance floor of these homes, instead, were the dining rooms and "large hall." Saying the houses were "modern in all points of construction and interior finish," Wissmann detailed "five bath rooms, all opening to the outer air, and not on a light shaft; nine servants' rooms, with a servants' staircase running to the roof, large passenger elevator, 5 master's bedrooms, salon and library." Wissmann held title to No. 11 for three years, selling what The Times called “the fine dwelling” to Benjamin Aymar Sands in April 1906. The newspaper noted “Mr. Sands will occupy the house.” Not only did the 53-year old financier, a member of Bowers & Sands, occupy the mansion, but so did his extended family. In the house with him and his wife, the former Amy K. Akin, were their daughter, Mary Emily (popularly called May); his unmarried sisters, E. Louise and Anna; brothers Charles Edward and Robert Cornell; and his married sister Katharine and her husband Theodore Havemeyer. Anna Sands weighed the possibility of firemen and hoses trampling through her home against the threat of a conflagration. She opted not to have brutish strangers swarming the house. She telephoned Fire Headquarters and instructed that she wanted only one fire fighter to come to the mansion. Fireman Reilly was nearby and he ran all the way to the No. 11. When he found the front door locked, he rang the bell. The butler made Reilly wait to be announced. According to The Times, after Anna Sands responded “Show him in,” the fire fighter was instructed to wipe his feet before entering. He found the hot spot between the wall and the wooden wainscoting, near a large fireplace. The vigilant butler hovered over him and when Reilly started to rip the “many mirrors in the room” from the walls, the servant stopped him. The entire Sands family was well-known for various reasons. Both Anna and her sister, E. Louise, were prominent in society and in charitable causes. Anna was important in Newport society, and E. Louise was highly involved in the Social Service Committee of the Volunteer Hospital. Charles Edward Sands was the National Court Tennis champion in 1905 and excelled as a racquets player; the only American to win the Racquette d’Or. And Katherine had married into one of Manhattan’s wealthiest families. Theodore Augustus Havemeyer’s family owned the largest sugar refining company in the world. In 1916 the family hired a new "second butler." Thor Veillegaard was 24-years old, a native of Norway. The son of wealthy parents, he was cultured, well-mannered and refined—in short the perfect butler. For months he “wore the Havemeyer livery,” as described by The New York Times, and announced guests, collected their cloaks and hats, and helped run the household. At some point Anna Sands discovered that a diamond brooch was missing. Theodore Havemeyer most likely did not notice that some of his expensive shirts and other clothing were disappearing one-by-one; since it was the butler who took care of his wardrobe. The butler was arrested on December 12 and a search of his bachelor apartment in the Bronx revealed more evidence. Among the many pawn tickets was one for Anna Sand’s expensive brooch; along with others for her gold watch and stickpin. As it turned out, the Havemeyers and Sands were the third set of victims. Veillegaard had also been butler to the Tilford and Stoddard families, and had stolen jewelry and other costly items from them as well. While E. Louise and Anna summered in Newport, the Havemeyers maintained a sprawling country estate, Cedar Hill, in Brookville, Long Island. The large old mansion was filled with Theodore Havemeyer’s collection of antique English furniture which he had assembled over many years. On the morning of December 10, 1927 the Katharine and Theodore left East 84th Street to spend a weekend there. They had no hint of what they had occurred overnight. The New York Times reported “They arrived to find [the house] a smoking ruin from fire.” A short circuit had sparked a fire, which was discovered by the caretaker. Because Brookville had no fire department, the volunteer fire department from Locust Valley had to respond. While they salvaged some furniture; most of the valuable antiques were destroyed. “Practically all that was saved was a collection of Chinese rugs stored in the attic,” said The Times. Havemeyer estimated the loss in furnishings at around $50,000 and to the house at $75,000. The total loss today would amount to approximately $1.8 million. The resolute couple determined to restore and rebuild Cedar Hill. In April 1932 Anna Sands underwent an operation in St. Luke’s Hospital. By now only E. Louise, and Katharine and Theodore were still living in No. 11 with her. The operation was unsuccessful and Anna died in the hospital on April 9. Her $500,000 estate would be equivalent to nearly $8.7 million in 2016. Two years later, in January, E. Louise became ill. On May 5, 1934 she died in the East 84th Street mansion. The Great Depression and changing trends in high-end living threatened Manhattan’s grand mansions. By now many had been razed for modern apartment buildings or converted to multi-family homes. Nevertheless the Havemeyers stayed on in No. 11 with their domestic staff. Theodore, however, had been in failing health since 1932, the year Anna died. At 9:00 on the night of July 30 Theodore A. Havemeyer died in Cedar Hill at the age of 67. Katharine returned to East 84th Street where she remained for years. Even as she aged, she remained a social presence. In December 1941, for instance, she hosted a dinner and dance in the mansion for her debutante niece, Katharine M. Sands. By mid-century the mansion was home to millionaire grain merchant Rene Eugene Fribourg. Like Theodore Havemeyer, he was interested in antiques and filled the house with French 18th century and Empire furniture, a collection of clocks and valuable artwork. Following his death in 1963 separate auctions were held at Sotheby’s in London; one for the furniture and clocks, one for his art (garnering nearly $3.5 million), and another that handled his outstanding collection of European porcelain. Many of the items were purchased by world-class museums. Four years after Fribourg’s death No. 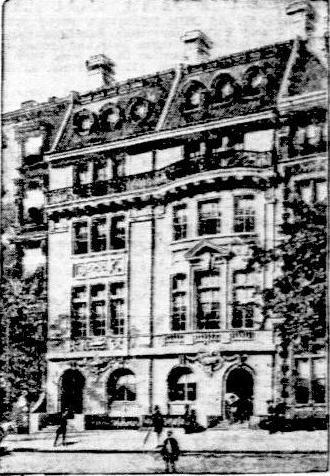 11 East 84th Street was sold to the Bulgarian Government as its Permanent Mission to the United Nations. On reporting the sale, The Times pointed out “The six-story mansion…contains 16 rooms, eight fireplaces, and eight bathrooms.” The Government paid $300,000 for the house. The elegant entrance doors have been replaced with formidably-solid replacements and bars understandably guard the ground floor window. Otherwise (with perhaps the exception of obtrusive window air conditioners), the magnificent Beaux Arts palace is little changed since its completion in 1903. Is central air something no one in New York knows about? I am always surprised by all those window units. In tepid defense, the logistics of running ductwork in historic structures like this is daunting. Sometimes the chimneys or dumbwaiters can be used; but even then disguising the A/C ducts is problematic. Then again, the atrocious metal boxes projecting from the windows are another eyesore. The issue is not New York's alone. As anyone knows by walking through many historic districts around the country and in suburban areas, the destruction of plaster ceilings, trim, paneled walls and woodwork usually precludes installing central air, unless unlimited funds are available in ones renovation budget or one intends to gut some or all of the interiors. I prefer seeing the AC units in the windows knowing the chances are pretty good that someone hasn't completely destroyed the interiors yet. I forget that in the east, gas-forced air is not the preferred system. I live in the West, where all we need to do is install a compressor to an existing system. (I am the original poster. If I try to post as an account rather than anonymous, the system tosses me out.) So central air in old houses like my own (1882) is more common. There are some wonderful modern systems out there now, however, that adapt well to older homes. Odd to think that my small town in Montana is ahead of the tech curve on New York.